Dead or Alive Touch Slot - Spin & Win up to 1000x your bet! 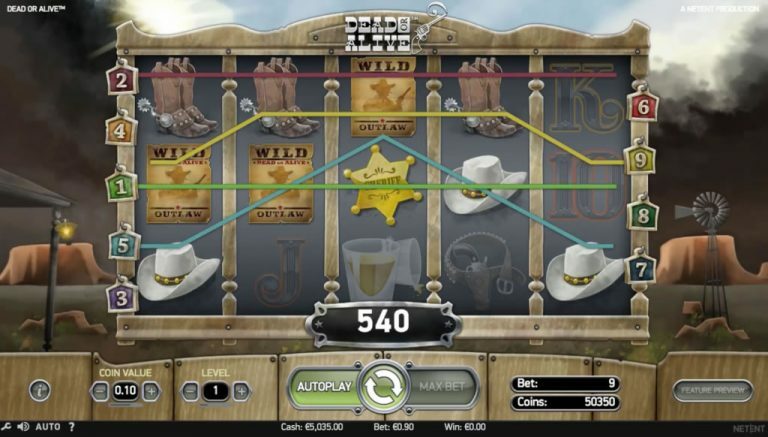 Dead or Alive is a video slot featuring a Wild West theme and is played on 5 reels with 9 paylines. This game, created by NetEnt, takes you to the Wild West, back at the turn of the 20th century, where you get to meet some of the most famous outlaws of the period. Although the gameplay is pretty basic, the slot still has some truly stunning graphics and sound effects and gives you a selection of features to help you win. Are you ready to saddle up and explore the Wild, Wild West? Let’s check out what the Dead or Alive slot has to offer! The Dead or Alive slot has 5 reels and 9 paylines and was developed by the world famous NetEnt. The game’s Wild West theme includes some of the best-known outlaws of the late 19th and early 20th centuries, such as Jesse James and Billy the Kid, among others. 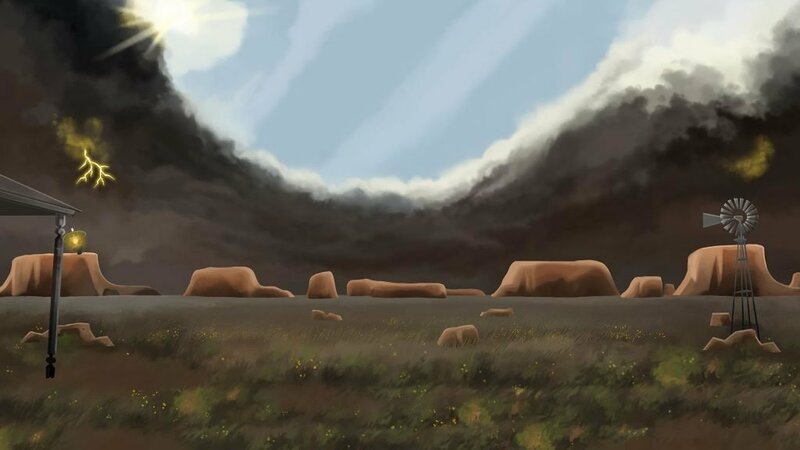 The game’s reels are set on a stereotypical western landscape that has ominous dark storm clouds and flashing lightning to add to the excitement. This is a game that has aged well and is a firm favorite amongst many seasoned slots players due to the potential for some massive wins. However, before you leap onto your trusty steed and head off on a western adventure, you’ll need to set your bet. As with most NetEnt slots, you simply set the coin size (ranging from 0.01 to 0.50), and then the bet level, which is in essence how many coins you plan on wagering with each spin. Dead or Alive doesn’t offer any special features within the main game, so you will have to settle just for wilds. In terms of special feature rounds, Dead or Alive does offer a free spins feature, but more about that in a moment. and, the sheriff’s badge pays a whopping 1000x. Note that a bet line win in coins is equal to the amount shown on the paytable multiplied by the bet level. There are other, lower-paying card symbols within the game as well, including the familiar King, Queen, Ace, Jack and 10. Additionally, there is a Wild symbol in the form of a ‘Wanted’ poster. The six-shooter is a scatter and pays for 2 or more scatters anywhere on the reels. If you are fortunate enough to get 5 scatters, you will be rewarded with a massive 2500X payout. Similar to most other video slots developed by NetEnt, Dead or Alive has Free Spins as one of its main features. This feature is triggered when you land 3 or more of the six-shooter scatter symbols on any location across the reels. This gives you 12 free spins with a 2x multiplier. However, the one thing that makes the Free Spins on this slot game truly special is the Sticky Wild feature. When playing the Free Spins, any wild symbols that you land, stay in their positions throughout the duration of your free spins, giving you more chances to win, plus each time one or more sticky wilds appear, it activates an additional 5 free spins, up to a maximum of 29 Free Spins. The free spins can be retriggered only once per free spins session. Dead or Alive does not have a dedicated bonus mini-game or feature, but the free spins combined with the sticky wilds feature, as described above, make up for this. This slot doesn’t have a dedicated jackpot amount and is also not linked to any progressive jackpot. Despite this, the accumulation of features and multipliers can provide some truly epic wins. Considering that 5 wilds pays 1500X your bet and 5 scatters payout 2500X your bet, it’s easy to see how you can rack up substantial amounts. This slot features 9 fixed betting lines. Dead or Alive is a highly volatile slot, which makes it ideal if you are looking for really big wins, but you will need to manage your bets and have some patience. Dead or Alive slot is fairly well made, and we’ve definitely seen higher quality slots from NetEnt. However, the theme is well portrayed, and gameplay is fast and fluid. The little animations after a win do add some effect. Overall, Dead or Alive is good fun and offers some excellent payouts and entertainment.